My mother told me it’s OK to refresh your lipstick in public. But no more than that. Everything else – mascara, concealer, eyeliner – should be saved for the restroom. I winced each time the subway jostled this lady while she had pointy things by her eyes. 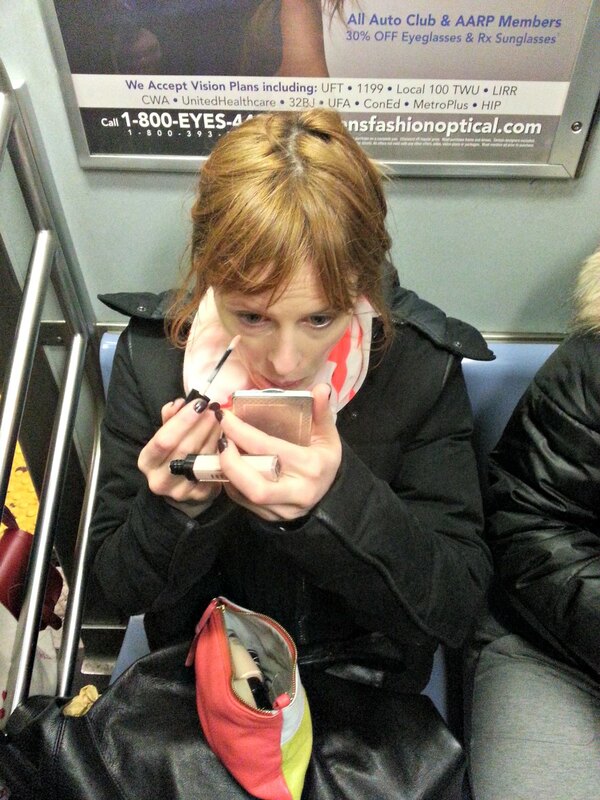 This entry was posted in NYC, Snark and tagged L train, lipstick, make up, manners, New York City, nyc, socially acceptable, spotted on the subway on March 19, 2013 by onechicklette. I’m going to give her the benefit of the doubt only because I was THAT girl a few days ago when I was running RIDICULOUSLY late. These things happen sometimes!! That kind of multitasking must require special talent. My mommy taught me the same as yours, but I always assumed it was because I’d make a mess of things if I tried to put on eyeliner while driving. The worst for me would be the eyelash curler. Can you imagine: squeeze, lurch, OUCH? Good Lord! I have enough trouble with that on dry land, much less on the move! 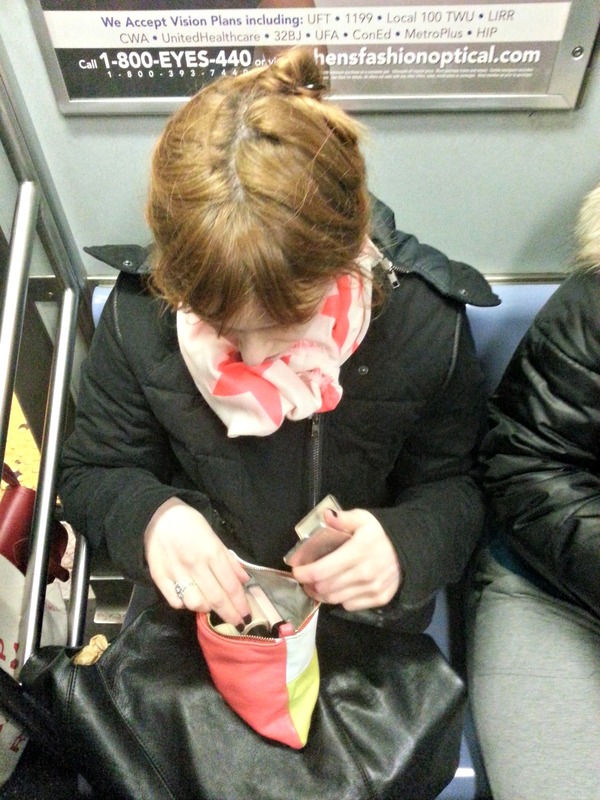 I’ve seen a girl apply eyeliner perfectly while on the L train. O.O I have no idea how to do any of this. In DC, I would catch the same train every morning. Every morning would be the same woman and she would ALWAYS be putting on her makeup. Foundation, eyeliner, lipliner, mascara, highlighters, everything. She would be using pencils too. I was just waiting for her to poke her eye out. Get up a few minutes earlier and put it on at home.